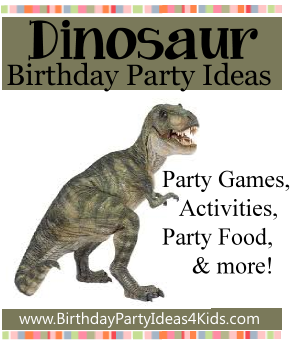 Fun ideas for a Dinosaur birthday party for kids. Trace a large dinosaur footprint onto the front of a blank white card. Write party information on the inside. Print the Dinosaur party invitation information on a small piece of paper - 5 to a 8x11 sheet. Cut them out and roll into scrolls. Put them inside plastic eggs with some speckled jelly beans for a dinosaur egg invitation. Decorate white or solid colored blank cards with dinosaur footprint stickers. Decorate the Dinosaur party like a jungle with green streamers and balloons. Set out blow up dinosaurs and pictures of dinosaurs, volcanoes and/or meteors. Set out plastic dinosaurs on the party table for guests to play with during the party. Make a fun dinosaur volcano that really erupts! Make a volcano shape with clay or play doh. In the center place a plastic tube about 1" wide and 5" high that will come right to the volcano top, but not be seen. When the guests are done forming their volcanoes around the tube place a small amount of baking soda in the bottom of the tube (about 1"). When everyone is done have them stand back a few feet and pour about 2 Tablespoons of Vinegar into the tube with the baking soda. The chemical reaction will make the volcano erupt ... bubble over the top of the volcano. The party guests can make one large one, or set out play doh or clay so they can make their own dinosaur volcano to take home. The object of the game is to stay away from the meteor and the new meteorites that form when other children are tagged. In a large playing field mark out two lines on either side of the area. Have the party guests stand behind one of the lines. Choose who will be “it” or the meteor for the fist game. The meteor yells out to the other players that are behind the lines and says " I dare you to come and _____ across my meteor field.” (The blank is filled in by what the players must do as they are crossing the meteor field. Hop, twirl, swim, run, run backwards, etc.) Then the players behind the lines must follow the directions of the person in the middle of the field and try and cross the meteor field to the other side without being tagged. Players that are tagged as they cross become meteorites and have to stand where they were tagged. In the next round both the meteor and the meteorites try and tag players as they go by but only the meteor can move around. The last player tagged becomes the new meteor. Instead of becoming meteorites the tagged children hold hands with the meteor and help tag players. The meteorites can catch players as they run by so the meteor can come by and tag them. Played like Pin the tail on the Donkey, only guests try and pin the teeth on the T-Rex. Buy a large poster of a T-Rex (or any dinosaur) and trace the teeth onto paper. Make several copies of the teeth and then cut them out. Place a number on the back of each set of teeth so the guests will know which one is theirs. Put sticky tape on the back of the teeth and give one to each child. Line the children up about 10 - 15 feet from the poster. One by one blindfold them and spin them around 3 times. Tell them to stick their T-Rex teeth as close to the mouth of the dinosaur on the poster as they can. The closest to the original wins a prize. Variation: Give a prize to the winner and then have small prizes for everyone who played the game. A fun way to give the prizes is to number several small prizes before the party - then have the children find the number on their paper teeth. They get the prize that matches the number on their teeth. Hide lots of plastic eggs all over the backyard or park. Give each party guest a backpack or bucket and tell them to find all the dinosaur eggs they can. Fill the dinosaur eggs with candy or prize numbers. If they find a prize number they get to turn in the dinosaur egg for a prize with the same number. Hide small dinosaurs and prizes in a sandbox. Give the party guests small shovels, brushes, etc. and tell them to excavate the dinosaur fossils (prizes). Make plaster of Paris dinosaur (or human) footprints or handprints. Mix Plaster of Paris according to directions. Pour into small pie pans - one for each child. While still wet let the Dinosaur party guests make handprints or footprints in the plaster. Also leaves twigs make interesting impressions. Add jewels or other embellishments while still wet. Set up to dry and let the guests take them home as a party favor.